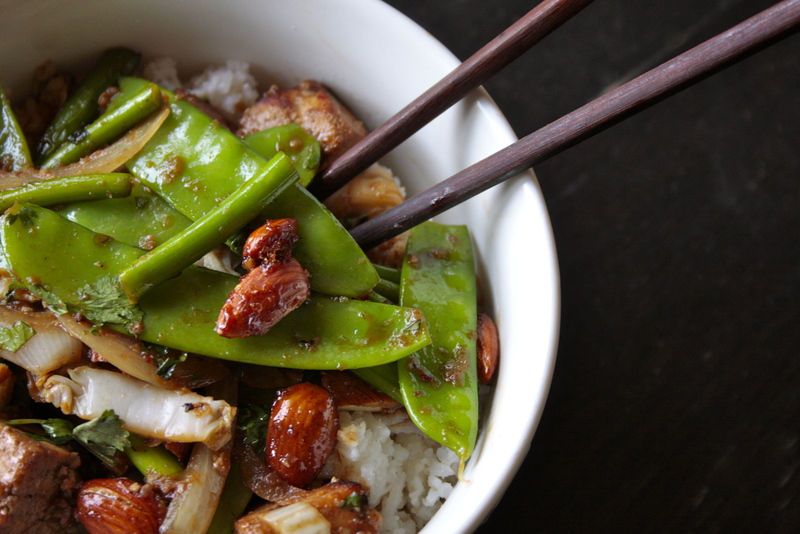 Snow Pea Summer Stir Fry | eating with S.O.L.E. Start by toasting a handful of almonds in a dry pan with sea salt and 5 spice blend. Toast until aromatic, then add a splash of maple syrup to the nuts, toss, remove from heat and set aside to cool. Fry the marinates tofu pieces (reserving marinade for later) allow all sides to brown evenly. Cook for 5 minutes before adding a huge handful of fresh snow peas. Toss peas in wok for about 3 minutes, then add back in cooked tofu and the reserved marinade liquid. Toss in candied nuts, a handful of freshly chopped cilantro and quick grate of fresh ginger.